4.1.1.1 The design of foundations should conform to BS EN 1997-1 and this clause (4). NOTE 1 Guidance on geotechnical design, construction, and verification can be found in the ICE manual of geotechnical engineering (2012), Volume II . NOTE 2 Guidance on the selection of a suitable foundation type can be found in the ICE manual of geotechnical engineering (2012), Volume I, Chapter 9  and Volume II, Chapter 52 . 4.1.1.2 The design of maritime works should conform to BS 6349. NOTE Guidance on geotechnical engineering principles, problematic soils, and site investigation can be found in the ICE manual of geotechnical engineering (2012), Volume I . 4.1.2.1 The design of spread foundations should conform to 4.1.1.1 and Clause 5.
on medium strength (or stronger) fine soils. 4.1.2.2 Spread foundations should not be placed on non-engineered fill unless such use can be justified on the basis of a thorough ground investigation and detailed design. Spread foundations should generally not be placed on engineered fill unless that fill is designed for the use of spread foundations. 4.1.3.1 The design of pile foundations should conform to 4.1.1.1 and Clause 6.
where the addition of a foundation load would cause instability of the existing ground (e.g. at the crest of an existing slope). 4.1.3.2 Deep foundations, such as piles, should be considered when no adequate bearing stratum exists at shallow depths to permit economic construction of spread foundations. 4.1.3.3 The design of helical steel pile foundations should conform to Annex A. The design of underpinning should conform to 4.1.1.1 and Annex B.
to provide adequate resistance to increased loading on an existing structure. NOTE 2 Guidance on the use of underpinning can be found in the ICE manual of geotechnical engineering (2012), Volume II, Chapter 83 . There are two different types of piled raft in common practice: raft-enhanced pile groups and pile-enhanced rafts. 4.1.5.1 The design of piled rafts should conform to 4.1.1.1 and Clause 5 and Clause 6.
to reduce the thickness of a raft foundation. NOTE 2 Guidance on the use of piled rafts can be found in the ICE manual of geotechnical engineering (2012), Volume II, Chapter 56 . 4.1.5.2 The design of raft-enhanced pile groups should ensure that stresses within both the piles and the raft do not exceed the elastic range of behaviour. 4.1.5.3 The design of pile-enhanced rafts should ensure that all of the piles mobilise their ultimate resistance before the raft reaches its ultimate resistance. 4.1.6.1 The design of piles used in piled embankments should conform to 4.1.1.1 and Clause 6.
to support infrastructure over unstable areas (e.g. land prone to mining subsidence). 4.1.6.2 The design of embankments should conform to BS 6031. 4.1.6.3 The design of basal reinforcement to piled embankments should conform to BS 8006-1:2010, 8.3. 4.2.1.1.1 Geotechnical data should be obtained in accordance with BS EN 1997-1:2004+A1:2013, Clause 3. 4.2.1.1.2 Particular attention should be given to the requirements of BS EN 1997-1:2004+A1:2013, 3.1. 4.2.1.1.3 Geotechnical investigations should conform to BS EN 1997-1:2004+A1rmation about the site from the desk study should be used to supplement that obtained in any new ground investigation. :2013, 3.2. 4.2.1.1.5 Sampling and testing of contaminated ground and groundwater should conform to BS 10175 and BS ISO 5667-11. 4.2.1.1.6 The spacing and depth of site investigations for foundations should conform to BS EN 1997-2:2007, B.3, and this clause. 4.2.1.1.7 The number of investigation points should be sufficient to establish ground conditions, and any variability in those conditions, in the vicinity of the foundation. A is the plan area of each building's footprint. 4.2.1.1.9 Where a development involves construction of several buildings, equation (1) may be applied to the aggregate plan area of the buildings' footprints, provided the ground conditions can be shown to be sufficiently uniform. 4.2.1.1.10 For high-rise buildings and industrial structures, the number of investigation points undertaken should conform to BS EN 1997-2:2007, B.3. bF is the smaller side length of the wall's foundation (on plan). 4.2.1.1.13 Where the base of the foundation is located on or near bedrock, the depth of investigation may be reduced. 4.2.1.1.14 The presence of trees and large shrubs should be noted during the course of the ground investigation, so that decisions can be taken concerning their retention or subsequent removal. NOTE Guidance on site investigation can be found in the ICE manual of geotechnical engineering (2012), Volume I, Section 4: Site investigation  and in the NHBC Design Guide NF21, Efficient design of piled foundations for low rise housing (2010), Section 4: Site investigation . 4.2.2.1 Design situations should be specified in accordance with BS EN 1997-1:2004+A1:2013, 2.2.
all other conditions specific to the site that can reasonably be forseen. 4.2.2.3 To conform to BS EN 1990, exceptional conditions involving local failure (such as a burst water pipe that continues to leak after the burst) should be classified as accidental design situations. 4.2.2.4 Design water levels should be compatible with the drainage provisions. NOTE Information about exclusion zones around buried highwalls can be found in BRE Report 424 . Design and construction considerations for foundations are given throughout BS EN 1997-1. The design considerations given in this clause are more specific examples of the issues that can affect the performance of a foundation. global ground movements (e.g. due to bulk excavation or filling, water table changes, etc.) that can cause foundation deformations, additional to those induced by superstructure loads, and/or additional forces in the foundation or superstructure. NOTE Global ground movements can be horizontal or vertical depending on the design situation. Provision of suitable drainage is vital to ensure the acceptable performance of a foundation. Groundwater control is separate from the control of surface water, such as rainfall run-off. 4.2.3.2.2 Surface water drains should be constructed using one of the types of pipe listed in 4.3.10. 4.2.3.2.3 Drainage systems should be designed for ease of maintenance and renewal during the design working life of the structure. 4.2.3.2.4 Drainage systems should be designed with positive outfalls to prevent ponding and include provisions of suitable discharge outfalls or soakaways. a secondary («backup») system specified – for example, a pipe or channel that encloses the primary system – that will prevent any potential leakage from entering the ground beneath or next to the structure. NOTE 1 Guidance on surface water control can be found in Groundwater lowering in construction , Construction dewatering and groundwater control , and Groundwater control: design and practice . NOTE 2 Guidance on groundwater control can be found in the ICE manual of geotechnical engineering (2012), Volume II, Chapter 80 .
amplification of loads or movements owing to resonance. NOTE Guidance on foundations subjected to cyclic and dynamic loads can be found in the ICE manual of geotechnical engineering (2012), Volume II, Chapter 60 . Foundations built adjacent to existing trees might suffer deleterious effects from the penetration of root-systems. These effects include increased loading on the structure and penetration of roots into joints or drainage systems. 4.2.3.4.1 The principles and procedures to be applied to achieve a harmonious and sustainable relationship between trees (including shrubs and hedges) and structures should conform to BS 5837. 4.2.3.4.2 Foundations should be designed to accommodate any volumetric changes in clay soils that might be caused by the presence of nearby trees. NOTE Guidance on building near trees can be found in NHBC Standards, Chapter 4.2 .
the carbon footprint of the construction and the use of the structure. Ground improvement is the modification of ground properties obtained by binding or densifying the ground or creating inclusions in the ground. Ground improvement involves the enhancement of ground properties, principally by strengthening of stiffening processes and compaction or densification mechanisms, to achieve a specific geotechnical performance (see ICE manual of geotechnical engineering, Volume I ). Ground improvement includes any method by which natural or disturbed ground has its geotechnical performance altered. Ground improvement covers many methods of ground treatment, including: modification, chemical alteration, reinforcement with steel or geosynthetics, strengthening by drainage, densification by vibration or consolidation, void filling, settlement or compensation grouting (see Contributions to Géotechnique 1948–2008 ). Ground improvement techniques can be used to alter ground strength, stiffness, or permeability. Common applications include methods to enhance bearing resistance, control post-construction settlements, increase or decrease ground permeability, improve ground stability, generate controlled ground displacement, and mitigate the risk of liquefaction. 4.2.3.6.1 The design of ground improvement by deep mixing should conform to BS EN 14679:2005, Clause 7. 4.2.3.6.2 The design of ground improvement by deep vibration should conform to BS EN 14731:2005, Clause 7. 4.2.3.6.3 The design of ground improvement by vertical drainage should conform BS EN 15237:2007, Clause 7. NOTE 1 Comprehensive guidance on the design and execution of the most common forms of ground improvement can be found in Ground Improvement . NOTE 2 Information about the role of ground improvement can be found in the ICE manual of geotechnical engineering (2012), Volume I, Chapter 25 . NOTE 3 Guidance on vibrocompaction and vibro stone columns, vibro concrete columns, and dynamic compaction can be found in the ICE manual of geotechnical engineering (2012), Volume II, Chapters 59 and 84 . NOTE 4 Guidance on a range of ground improvement techniques can be found in CIRIA Reports C572  and C573 . NOTE 5 Guidance on grouting for ground engineering (including permeation, rock grouting, hydrofracture, ground compaction, jet grouting, and compensation grouting) can be found in CIRIA Report C514 . NOTE 6 Guidance on soil mixing can be found in the BRE Design Guide to soft soil stabilisation . NOTE 7 Information about vibro stone columns can be found in BRE Report BR 391 . NOTE 8 Information about the design of vibrocompaction/vibroflotation and vertical band drains can be found in the Institution of Civil Engineers' Specification for ground treatment . NOTE 9 Guidance on the design, construction and control of rigid inclusion ground improvements can be found in the recommendations of the ASIRI National Project . NHBC. NHBC Standards. Available from: www.nhbc.co.uk (last viewed 25/6/15). 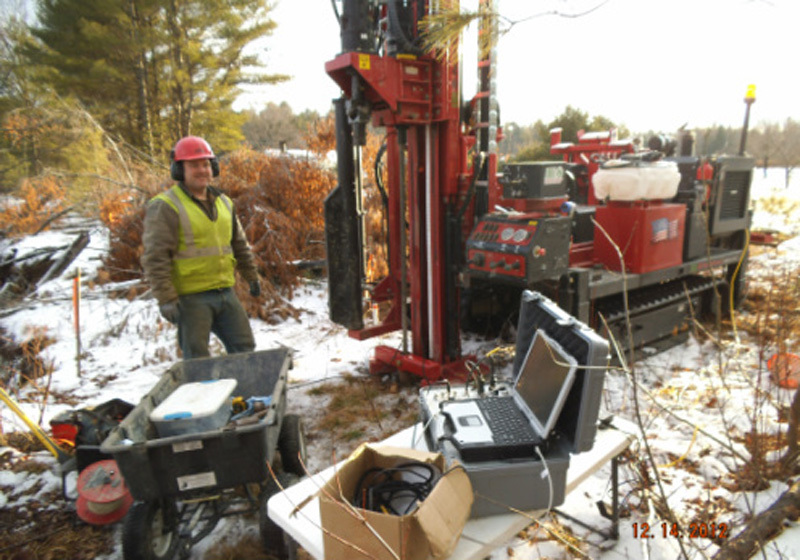 Advantages of CPT testing to test borings include continuous data for soil profiles, improved measurements of critical geotechnical design parameters, and ability to obtain site specific shear wave velocity data for improved seismic site design and liquefaction potential.